The SAI Brain was on display at 744 E. 3rd Street in Bloomington, Indiana, and was exhibited there from May 1 through October 15, 2012. Click here for a map. Sponsor: The Stone Age Institute, Drs. Kathy Schick and Nicholas Toth, Directors. Artists: Jon and Patricia Hecker of Tattoo Dreams. 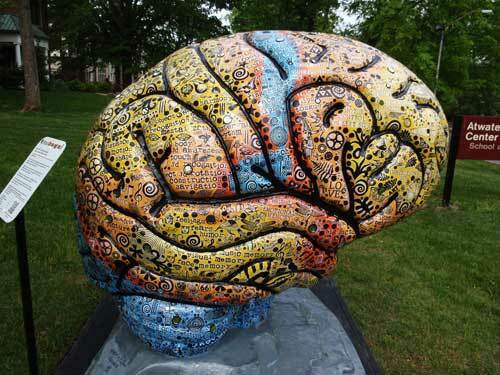 The Stone Age Institute brain has been painted to reflect how the human brain has evolved. Yellow: The most expansion relative to a "primitive" brain. Detail of the Stone Age Institute Brain. When co-Directors Kathy Schick and Nicholas Toth were invited to participate as a sponsor of a Bloomington community art project called The Brain Extravaganza, they thought it would be a great way to support the community and help the local nonprofit organizing the project, Jill Bolte Taylor BRAINS, Inc., to increase awareness of the Stone Age Institute's science and education mission, and to provide a valuable tool to help people understand human brain evolution. The Brain Extravaganza is the "brain child" of Jill Bolte Taylor, who wrote the book Stroke of Insight after she experienced a stroke. (A movie is now in production based on her book, directed by Ron Howard and starring Jodie Foster). Jill is a neuroanatomist by profession, and she is trying to promote awareness, appreciation, and education of the brain by bringing together sponsors and artisans to work on huge fiberglass models of the brain. 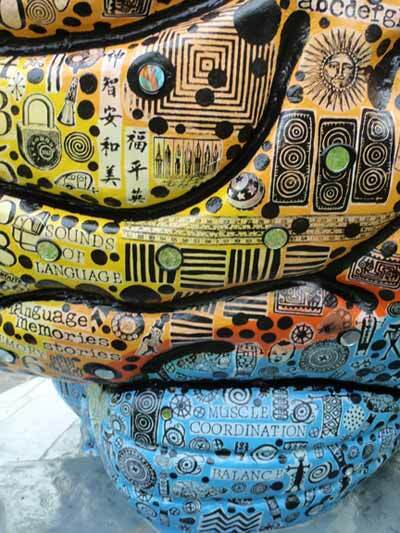 Once completed, the brain creations would be publicly exhibited as works of art all over the town of Bloomington, Indiana. Kathy and Nick's vision for the Stone Age Institute-sponsored brain was for it to be a vital tool for science education, to help people learn more about human evolution and the ways evolution has shaped our brains and how our brains work. They met with artists Jon and Patricia Hecker to discuss this vision for the science education aspect of the SAI-sponsored brain and to "brainstorm" about different artistic directions that might be taken. The Heckers (http://www.heckerdesign.com) are a husband-and-wife team with an art studio just outside of Bloomington and specialize in crafting fine wooden boxes embellished with unique designs and stamps. After discussing possible ways this evolutionary theme might be developed and the associated aesthetic possibilities, they all agreed on a solution that promised to be hugely informative about human brain evolution and also richly artistic, creative, and visually dynamic. The plan was to represent human brain evolution with an underlying color palette to show which areas of the brain have expanded the most (and the least) in the past 30 to 40 million years of human evolution. (This was based largely on a scientific paper published in the Proceedings of the National Academy of Sciences in July of 2010 - see the reference above). 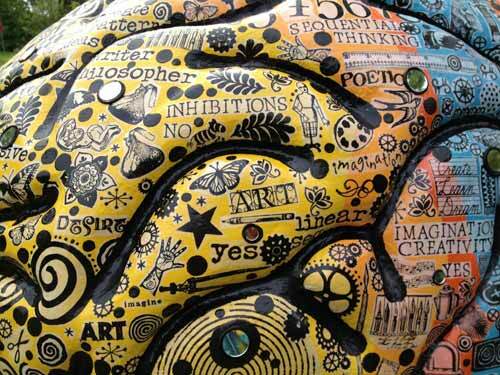 On top of this painted brain, the artists would apply stamped images and words from their extensive collection of stamps to reflect and evoke many of the richly diverse functions and activities of the human brain. To aid in this process, Kathy and Nick provided the artists some "maps" of human brain function to help guide and spur this creative process. 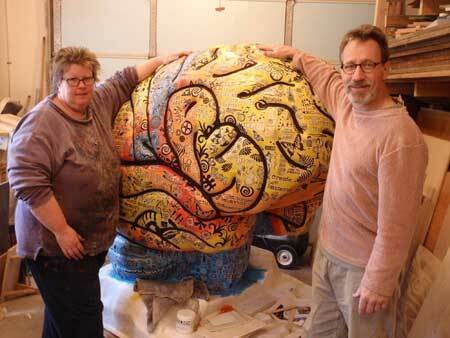 The artists began their artwork on the giant brain in February and completed the project in April of 2012. A close-up of the Stone Age Institute brain. The Stone Age Institute-sponsored brain project has resulted in the perfect combination of artistic creation and science education. We believe that our brain is beautiful, dynamic, visually powerful, and even fun, as well as richly informative about human evolution and how it has affected our brain. In all, 22 brain creations were completed by April 28, 2012, when all the brains were unveiled in a grand launch party at the Bloomington South High School Gymnasium. After the public unveiling, the brains have been placed in strategic locations around the town of Bloomington, Indiana, including several on the campus of Indiana University (including ours), where they will be on display until mid-October, 2012. Check out the Brain Extravaganza website for more information and a map of where the 22 brains are located around Bloomington.